From enormous Crusader castles to labyrinthine mosques, Syria is a country jam-packed with truly magnificent historical sites. How to choose the best of the best when visiting the fabulously historical country? A must on the tourist trail is the Umayyad Mosque, converted from a Byzantine Temple in 705 AD. Frequently dubbed the most beautiful mosque in Syria, the Umayyad Mosque is one of the holiest sites of worship in the world for Muslims. The enormous Citadel, constructed by the Seleucids in the 4th century BC, is also well worth a stop, as is the Great Colonnade. If you have the time, you will also want to pay a visit to the National Museum, Syria’s most important museum. The only thing that rivals Syria’s marvelous ancient architecture is its sublime modern cuisine. From kebabs and halabi, to hummus, tabbouleh, and fattoush, Syria offers some of the world’s best food. The best place to get a bite to eat? One of Syria’s many souqs, of course. Vendors in these traditional markets, some of which date back to the Middle Ages, serve up a variety of delectable dishes. If you’re looking for something a bit more formal, you would be well-advised to head to Damascus’ Naranj, situated right by the Roman Arc on Straight Street. This is a true gem of the Old City and by far one of the best restaurants in the country. For help locating some of the country’s best food, be sure to bring along a GPS Travel Map. 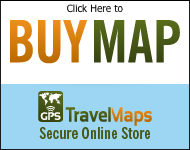 With GPS Travel Maps, you will also know where you are and how to best get to where you are going. Pick up our Syria maps. This GPS map will give you turn by turn directions to your destination using a point of interest (POI), city point, and/or latitude and longitude, with the ability to preplan driving destinations before getting into your car.